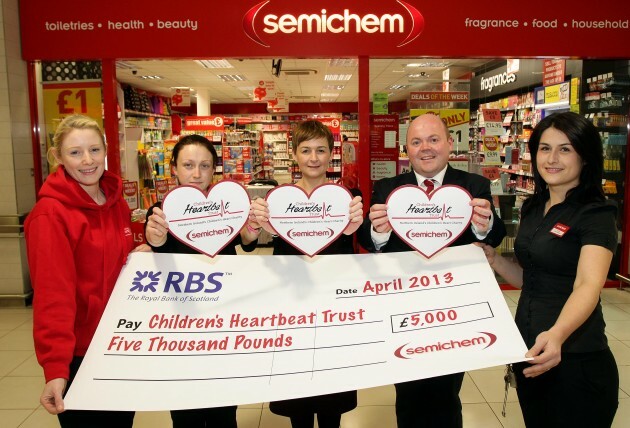 Semichem stores in Northern Ireland have raised over £5,000 for the Children’s Heartbeat Trust, at the halfway point in their charity partnership year. The announcement was made at a cheque presentation to mark the milestone to Sarah Quinlan from the Children’s Heartbeat Trust at Semichem’s Kennedy Centre store in Belfast. Store teams have undertaken in-store raffles, charity collecting tins and fundraising challenges, including staff wearing their pyjamas at the Park Centre Semichem in Belfast to raise funds. More fundraising events and challenges are planned over the coming months to help Semichem Northern Ireland reach its £10,000 fundraising target for the charity. Semichem, which has 25 stores across Northern Ireland, is raising funds for life-saving research into children’s heart disease and new medical equipment and resources for the Clark Clinic. The funds will also go towards new parental support groups for families of children with heart disease and family accommodation at the hospital. The Clark Clinic is the only regional unit for all children in Northern Ireland requiring specialist treatment for heart conditions.